Finally I have made my very first crochet sweater.! It is an easy and cropped one with long arms.. and sooo soft! But of course not at all perfect – I can see several things to do better next time. 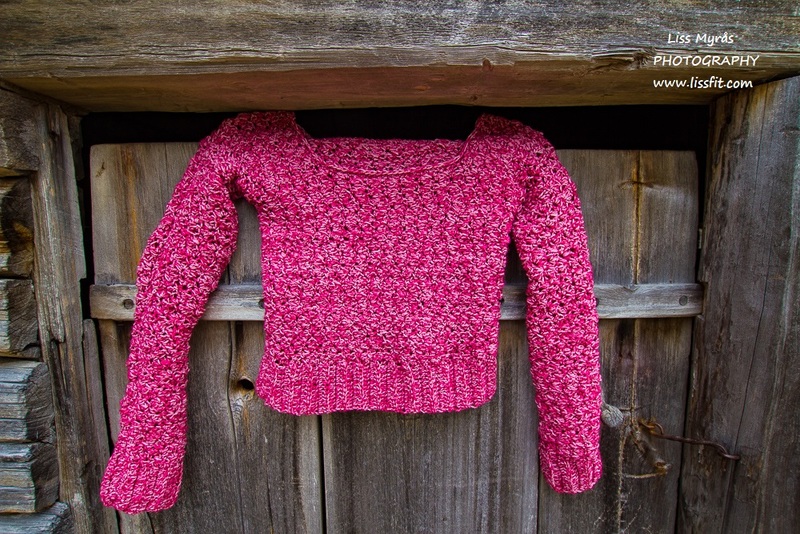 But it is a learning process where I’m getting ready to create my dream crochet sweater from a beautiful yarn already waiting in my yarn closet for a while. Warm and cosy autumn evenings for crocheting are very welcome. Through all summer I have not touched a crochet hook at all, but the fingers have been itching for it alright, that’s for sure. Working and hiking in Lofoten took up all time – and when I came home again after a great summer in Norway, a lot of big and small things had to be finished before “continuing as normal” again. So dear readers, I have not forgotten my blog, it just comes last when I have to prioritize. So, this weekend I and puppy did a windy and chilly walk along Långnäset headland (near Östalbodarna in Myckelgensjö) in beautiful autumn colours, and shot some photos of my “very late summer sweater”, while puppy freely could run around like a craze. Perhaps a bit too cold for an exposed boat neck line and cropped waist these days, but still a thick warming sweater where it covers. Looking so much forward to make another one, maybe with a bit longer waistline next time.. and more suitable for use in autumn/winter. Easy to crochet, if I can – everyone can indeed! OMG. You made it by yourself?! It looks amazing.